Hello and Happy Friday! This week seemed to zoom by, and I can't believe that February is just around the corner. I'm getting a jump start on some cards since there are quite a few friends and family with birthdays next month. On the original image, the balloon is cut off. I printed the image again and finished drawing in the rest of the balloon, cut it out, and colored it with Copics. I pressed the image onto a pad of Versamark ink and sprinkled clear embossing powder over and heated it with my heat gun. As soon as all the powder was melted, I immediately poured another layer of powder over the image and heated it again. I repeated this process three more times. Each time the balloon became smoother and glossier. You get the same result as if you used Glossy Accents, and as soon as it cools, you can handle it without having to guess if it's dry--and there are no air bubbles! Hope you try this technique and use your Glossy Accents for smaller, more manageable images. Thanks for visiting today.....hope you have a fun weekend ahead! 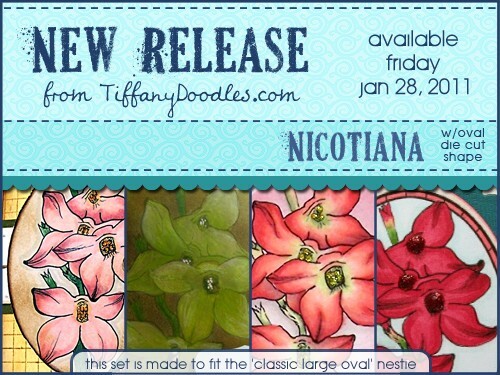 Tiffany Doodles has been having sneak peeks of three of the newest floral digis that will go on sale in the store on Friday, January 28th. Peeks of the angel trumpet and daphne have already been shared and today's peeks are the beautiful nicotiana from some of my fellow DT members. Aren't they gorgeous? You'll receive two digital images in a set, one of which fits inside of an oval shaped die. I emailed Tiffany to whine about my problem and she suggested that I emboss the image as soon as it came out of the printer. I've heard about stampers doing this but never tried it myself. Out of sheer frustration, I decided to give it a try. I poured some clear embossing powder as soon, and I mean AS SOON as the card rolled out of the printer and lo and behold, the powder stuck! A quick zap with my heat gun and you'd think I used embossing ink. I let it cool, and then colored it and there was no smearing at all! Hooray! Problem solved! And no damage to my Copics, too. Here are the two cards I made with the daphne. Even though they're a day late, I managed to learn something new, and hope to share this tip with you if you ever have a problem with smearing digis. Thanks, Tiff! Remember that the three new floral digis go on sale January 28th and if you purchase all three sets, you'll receive 10% off through the weekend. What a great deal! I made a "lazy" card this weekend, using one of Penny Black's new Valentine images, Hedgehopper. I love this image of the flying hedgehog, trailing along some love. I call this a lazy card because it has very minimal coloring on it and I managed to give my Copics a rest. I basically used just my Prismacolor pencils and highlighted most of the image. Gotta love this technique on kraft. I added some white dots on the clouds and a little Glossy Accents on the hearts and the card was done. Thanks, always, for stopping by. Hope you're all off to a great week! From January 24th through January 26th, Tiffany Doodles is having sneak peeks of her newest images which will all be released in the store on January 28th. Some of the images fit nicely in some name brand dies, to make your cardmaking even easier. Here's a "tiny teaser" of the images for the peek. Tiffany is such a teaser! I don't think you can enlarge the teaser graphic, so you'll just have to visit Tiffany Doodles starting tomorrow for the peeks. Think you can wait? Hello, and Happy Friday! Well, I FINALLY made a card using Lawn Fawn stamps! I've been hoarding them for a long time--I think I own almost every set!--and decided to stamp a card for Valentine's Day. I couldn't resist My Silly Valentine because of the adorable BUNNY and matching sentiment. My card is inspired by this card by Teri, one of Lawn Fawn's DT members. I also used Bannerific which features these cute banner flags and did a bit of paper piecing with Cosmo Cricket paper scraps. Lawn Fawn offers such high quality stamps and Kelly Marie, the owner, is such a sweetie. She always gives you a small "thank you" stamp or some small goodie when you receive your order, along with a handwritten note. Thanks so much for stopping by today. Hope you all have a warm and sunny weekend! Tiddly Inks Challenge #33 -- Refresh Me! The last challenge at Tiddly Inks was to create an all white card, using no color, except on the image. I couldn't wait to challenge myself, and use one of Christy's newest digis--Donna's Adventure. Yep, she's still toting her little umbrella, folded up and tucked in her wagon since the sun is out--for now. I die cut the cloud, sun, and grass and ran them through the Cuttlebug embossing folder for a bit of texture. The sentiment was stamped in Pumice Stone distress ink so it wouldn't be so bold. I love this digi and I hope Christy has more adventures in store for Donna. And for your convenience, this digi is also sold pre colored, so you can put together a super quick card. And congratulations to Anette H. and Cathy Fong who were the prize winners of our recent Hero Arts 2011 Catalog blog hop! They both won sets of wood, clear, and cling stamps from the new catalog. Lucky ducks! Hello! Did you all hop Hero Arts' 2011 Catalog blog hop this past week? There was so much inspiration from my hostess sisters, and I'm truly honored and humbled that I was part of such a fun event. Here's a quick card that I made using My Type (CG280). The alphabet background is by Cornish Heritage Farms. I stamped the sentiment with some G Studio alpha stamps that I got for $1--gotta love a bargain! I punched out the asterisk and covered it and the typewriter keys with Glossy Accents for some dimension. You have until Sunday, January 16th at midnight PST to leave your comments, and two winners of Hero Arts 2011 catalog stamps will be announced here on the Hero Arts blog on Monday, January 17th. Good luck! I hope it's YOU! Hello, and welcome to Day 4 of Hero Arts' 2011 Catalog blog hop, featuring former Hero Arts hostesses! I'm so honored to be a part of this fun hop, and I'm sure you'll find lots of inspiration this week. If you arrived from Linda's fabulous blog, you're on the right track. If not, start at the Hero Arts blog, and don't forget to leave comments along the way to win Hero Arts 2011 catalog stamps! Note: If you do find a broken link, you can always go back to the Hero Arts blog for the master list of blog links. Also, please email tami@heroarts.com and provide the blog address that has the bad link so we can fix it. Thanks! My first card uses the new stamp set called Going (CL478). I like that Hero Arts came out with some masculine images, and the cars and motorcycles are perfect for the guy(s) in your life. I stamped the car and masked the image, then overstamped with the new Envelope Pattern Design Block (S5507) in Walnut Stain distress ink. After coloring the image with Copics, I couldn't resist going over the entire car with Glossy Accents. I love how the car looks like a shiny sticker. My next card uses Delicate Leaf Clusters (CL477). I clear embossed the leaves and ink distressed with Wild Honey distress ink, then overstamped with Thank You Definition (CG268) in Vintage Photo distress ink. 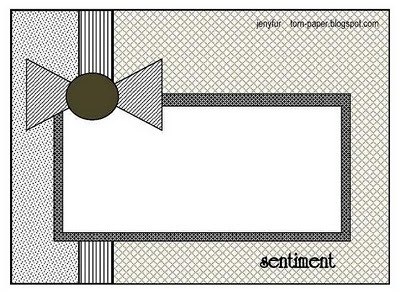 After assembling the images on pop dots, I stamped the sentiment from this set in Papertrey Ink's Vintage Cream. Since the cardstock is textured, I embossed the sentiment to make it a little easier to read. And lastly, this card is a twist on an earlier one that I shared using Dancing With Flowers (CG266). This time, I used kraft cardstock and Papertrey Ink's Vintage Cream ink so the silhouette image has a "ghostly" look. I added some mini pink pearls for just a touch of color, and a bit of Hero Arts lace for a vintage look. That wraps it up for me! Thanks so much for hopping by. I'll send you on your way to Sarah's blog, for more Hero Arts goodness. Stay tuned tomorrow for the fifth and final day of the blog hop which will start at Deborah's blog. Hello, and happy Monday! Hope you all had a great weekend and you're ready for the Hero Arts Hostess' blog hop this week. Every day, several of the twenty-two former hostesses will be sharing lots of card inspiration using Hero Arts' latest 2011 stamps. In honor of this hop, I'd like to share a card featuring one of their new silhouette designs called Dancing With Flowers. A dear friend gave this stamp to me, and it's quickly becoming one of my favorites. I stamped the new Thank You Definition first, then I stamped the silhouette, in Hero Arts shadow ink. The background is Hero Arts Large Canvas Stripes, and the scallops were stamped with Raindrop Background. The sentiment is a Hero Arts Archiver's exclusive set called Friend, given to me by another sweet friend. Start at the Hero Arts blog, and visit today's hostesses and prepare to be inspired by their creativity! Happy hopping! I decided to use one of Tiffany's newest Valentine digis--Umbrella with Hearts. How could I resist an umbrella? Especially one overflowing with so many little hearts. The digi fit perfectly in a Labels One Nestabilities die, so I created a square card and loosely followed the sketch. I colored the image with Copics and dyed the seam binding with some Copic ink refills to match. I used Hero Arts Raindrop Background and ink distressed with Antique Linen distress ink. I sponged inside the Nestie with the same ink before I removed the piece from the die and dotted around the umbrella with a white Signo pigment pen. The sentiment of x's and o's is from Lawn Fawn. 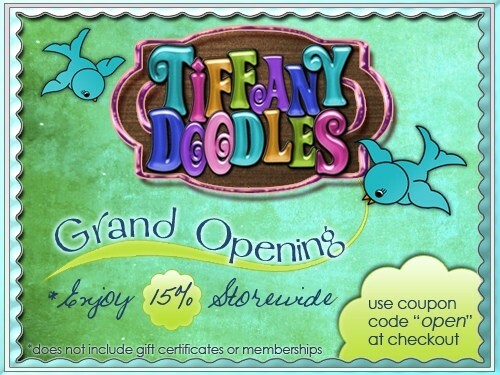 Stop by and shop the Tiffany Doodles store and receive 15% off your total purchase, for a limited time only. And be sure to visit our design team to see their wonderful creations, and play along with us, too! This is probably the fastest card I've ever made. This little shih tzu is a digital freebie named Kiki, from Christy Croll of Tiddly Inks. I saw the digi on the Tiddly Inks blog yesterday, printed it out and colored it and finished the card by the evening. Isn't she a cutie? I Googled "shih tzu" to see how to color one of these breeds. Originally, I was going to put a heart in her mouth, but in the end, I decided to leave her plain and just drew in some grass. I followed Kim's great grass tutorial here. I wasn't sure what sentiment to use with Kiki, and my daughter--a teacher--suggested "I woof you" and I liked it! The dotty background was a piece that was waiting in my scrap bag, so all I did was die cut the back piece and the card was done. Visit the Tiddly Inks store for more great images from Christy. And stay tuned because she'll be adding more images for release on January 11th! A new year....a new store! Happy 2011! Hope your celebrations were safe and fun. Any resolutions? Craftwise, I resolve to use some older, untouched supplies and stamps and try to clean up as soon as I've completed a card or project. But on the other hand, if I clean up too much, I won't know where I put everything! I like "organized chaos"--how about you? Christy is having a New Year's event on the Tiddly Inks blog. Make a card using one of her New Year's digis and if she chooses it, you'll receive a $10 gift certificate and have your card showcased on the store front. Pretty cool, huh? 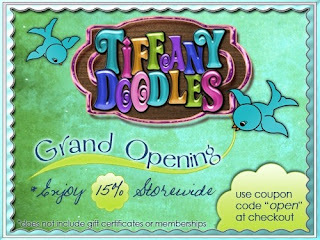 And January 1st marks the grand opening of Tiffany Doodles new store! Now you can find and buy Tiffany's digital images in one convenient spot. For a limited time, you'll receive 15% off your purchases, and she has a "club membership" which offers member discounts and lots of freebies, too. All the digis now have "points" so you can keep track of them and redeem them for digis. Remember that every 7th of the month is a new challenge where you can win even more digis. Visit the store here for more information, and shop for Tiffany's brand new Valentine digis!